You don’t have to have Texas roots — though The Legal Genealogist does, and deep ones — to be moved by the story. The outcome was pretty much a foregone conclusion even when those words were uttered, by Colonel William Barrett Travis. A small band of Texans defending an outpost in the city of San Antonio called the Alamo against a much larger Mexican Army… fewer than 250 men total inside the walls against more than 4,000 outside. And, 181 years ago yesterday, the story came to its inevitable end. Today, there is a marble sarcophagus in the Cathedral of San Fernando in San Antonio with what are believed to be the remains from the funeral pyre of the men of the Alamo. And, every March 6th, there is the ceremony. 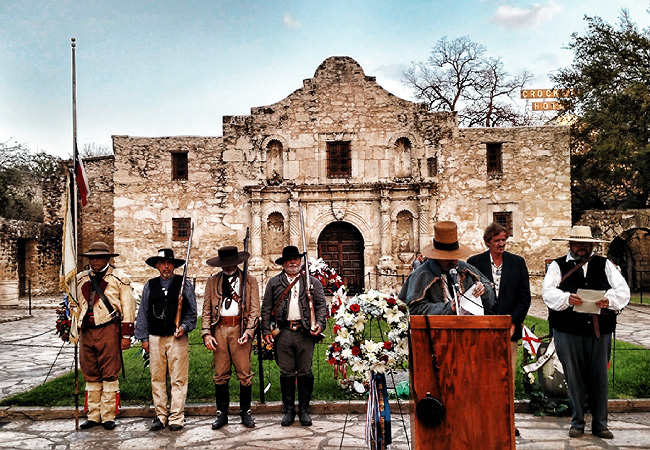 Conducted by the San Antonio Living History Association, it begins at dawn — the same time that the final assault on tha Alamo began, 181 years ago. At dusk, a second ceremony is held to commemorate the lighting of those funeral pyres… 181 years ago. There are research resources if you have roots in the Texas Republic, or in the Alamo defense itself. Start with the official website of The Alamo itself. 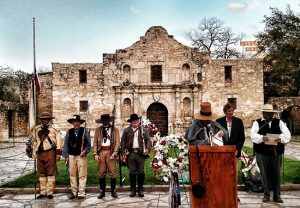 Go on to the Handbook of Texas Online and its Alamo-related resources. There are published histories and other resources available on the Resources for Educators page at the Portal to Texas History. And whether you have ancestors directly involved or not… it’s an amazing moment in history. A powerful episode in history.